In 1936, the Denver Zephyr made the 538-mile trip from Omaha to Denver in approximately seven hours at an average speed of 75 miles per hour with stops. In 2014, the Acela Express makes the 456-mile trip from Washington to Boston in approximately the same amount of time at an average speed of around 68 miles per hour with stops. Those averages, however, are only accurate 74% of the time, which is Acela Express’s current twelve-month on-time performance. How is it that over the course of nearly 80 years, the United States has actually made negative progress in terms of average train speed over medium-distance routes? The answer lies in the continued use of the centuries-old right-of-ways for our intercity rail routes. For all of the comforts and amenities that the Acela Express now offers, the chief limiting factor for the most important measure of rail modernity—speed—is the right-of-way of the tracks. Unlike the vast majority of European and Asian high-speed trains, which operate on a dedicated and separate right-of-way, Amtrak shares the Northeast Corridor with high-frequency commuter trains and slow freight trains. In addition to Amtrak’s 11.4 million riders, Northeast Corridor train traffic includes approximately 260 million commuters and 14 million car-miles of freight movement per year. In sum, the Acela Express operates high-speed rail service on the most congested, low-speed rail corridor in the world. Making high-speed service on the Northeast Corridor even more problematic, the Acela Express travels through 95 intermediate stations along its right-of-way, which further restricts its operating speed due to the Federal Railroad Administration’s station-passthrough speed limits. The problems of the Northeast Corridor’s right-of-way are not, however, uniform along the entirety of its route. The southern section of the Northeast Corridor, from New York to Washington, was built for speed and efficiency. The majority of the right-of-way is relatively straight and contains express tracks that are able to bypass intermediate station platforms. From New York to Philadelphia, Acela trains operate at an average maximum speed of over 105 miles per hour. Speed is considerably reduced at a number of interlocking bypass points in northern New Jersey as well as over the 100-year-old Portal Bridge by Secaucus Junction. Further, at the approaches to Trenton and Philadelphia, speeds are reduced to accommodate tighter curves in order to access stations in the city center. 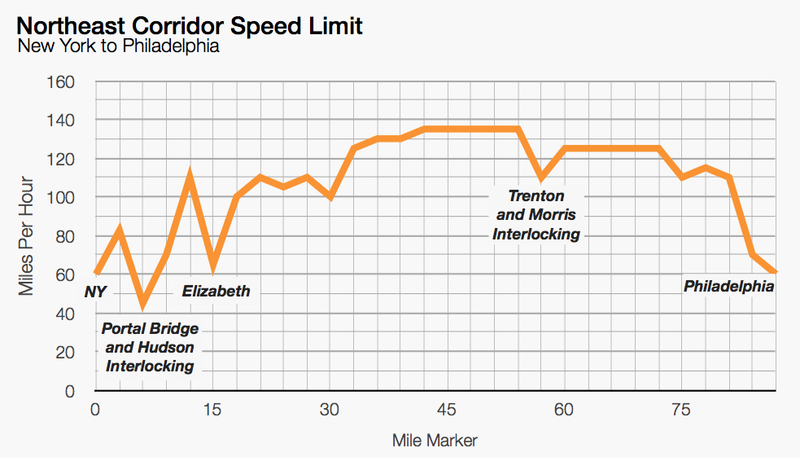 From Philadelphia to Washington, Acela trains are able to operate at an average speed of over 110 miles per hour. With minimal curvature throughout Maryland, trains average a maximum speed of over 125 miles per hour for most of the route. However, speeds are significantly reduced at the approaches to and within key city stations. In Wilmington, a reduction of trackage coupled with very tight curves leading to Wilmington Station result in average operating speeds of under 40 miles per hour. Further, aging infrastructure and tight curves over the course of nearly 20 miles around Baltimore similarly limit speeds. 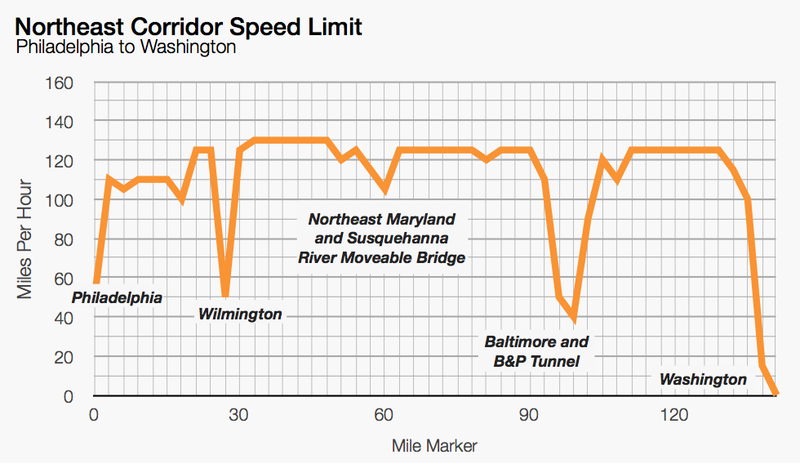 One curve in the B&P Tunnel outside of Baltimore has a maximum speed limit of just 30 miles per hour. While trains currently operating along the southern section of the Northeast Corridor average speeds of only 80 miles per hour in practice, the foundations of this section of track are sound. Aside from the identified choke points, trains operating along the southern section of the Northeast Corridor at average speeds of just 110 miles per hour would be able to travel from New York to Washington in just two hours. 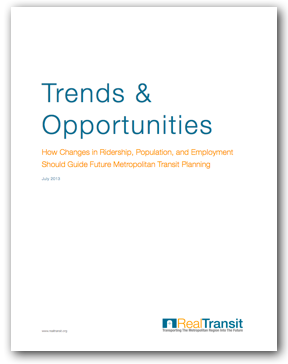 With proper management of concurrent commuter rail systems, carefully chosen capital expenditures have the potential to dramatically increase overall speeds and travel time. On the other hand, the northern section of the Northeast Corridor suffers from a fundamentally deficient right-of-way that cannot allow for significant reductions in travel time absent the construction of a completely new alignment. Unlike the southern section of the Northeast Corridor, which takes a mostly inland route from New York to Washington, the northern section of the Northeast Corridor travels along the northern coast of the Long Island Sound. This route is plagued with tight curves, high density development, and numerous bay and river crossings. 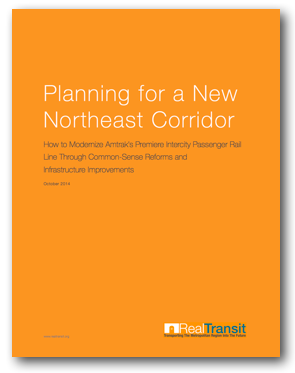 Not only does this result in slower maximum speeds throughout the line, but this combination of obstacles makes upgrading the northern section of the Northeast Corridor much more challenging than upgrading the southern section of the Northeast Corridor. One of the most significant choke points is the 45-mile stretch of track traveling through New London, CT from Clinton, CT to the Rhode Island border. 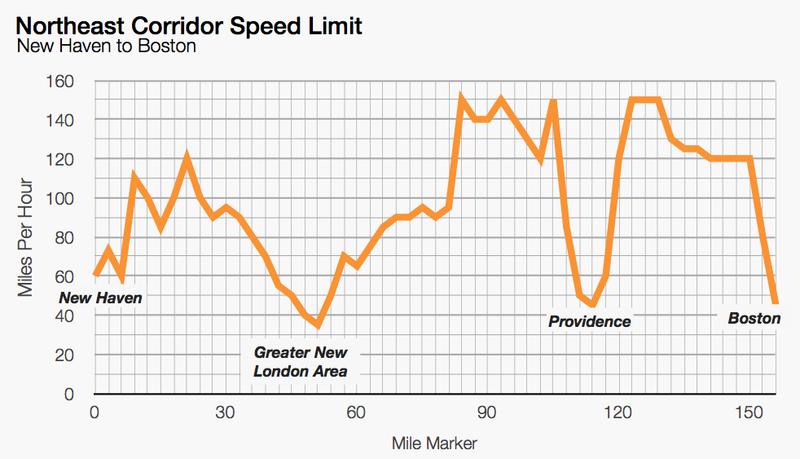 Not only is there no express tracks over this portion of the Northeast Corridor, but there are nearly 50 independent curves that cause speed reductions to as low as 25 miles per hour through New London. There are, however, two sections of track totaling 23 miles that allow for maximum speeds of 150 miles per hour. Still, gains from these high speeds are diminished due to the additional choke points in Providence and Boston. Trains from New York to New Haven suffer from similar right-of-way problems. Aside from delay and congestion from within New York Penn Station, Acela Express trains leaving Penn Station must share tunnels and portions of track with both MTA LIRR and MTA Metro-North trains. Traveling through Queens, Amtrak trains pass through the busiest convergence of rail tracks in the country, Harold Interlocking, where speeds are limited to under 55 miles per hour in theory, but are actually much lower in practice. 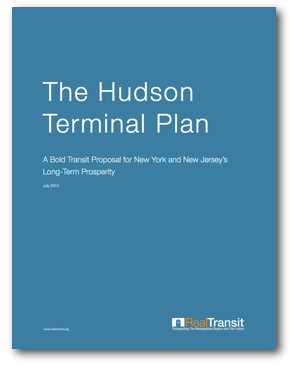 While the MTA is currently working on creating dedicated tracks to better bypass Harold Interlocking, studies are also underway for plans to bring, for the first time, MTA Metro-North trains to Penn Station using shared Amtrak tracks. Overall, Acela Express trains traveling from New Haven to Boston average a maximum speed of slightly over 90 miles per hour, which is 20 miles per hour less than the average maximum speed for the southern section of the Northeast Corridor. However, in real-world operating conditions, the fastest Acela trains traveling from New York to Boston average speeds of just 65 miles per hour. In order to reduce congestion and increase maximum operating speeds, the simple addition of tracks and elimination of curves will not suffice. Thus, the creation of a new, dedicated right-of-way for the northern section of the Northeast Corridor is necessary to achieve truly higher-speeds and increased reliability.